Former "SNL" cast member Jason Sudeikis returned to perform as the former vice president. "Saturday Night Live" ridiculed former Vice President Joe Biden as he faced multiple allegations that he invaded the personal space of women over the years. Biden, who is expected to announce soon whether he will run for president, has defended himself by saying it's in his nature to be affectionate. He also said he respects his critics and that he will be "mindful" of his physical contact in the future. 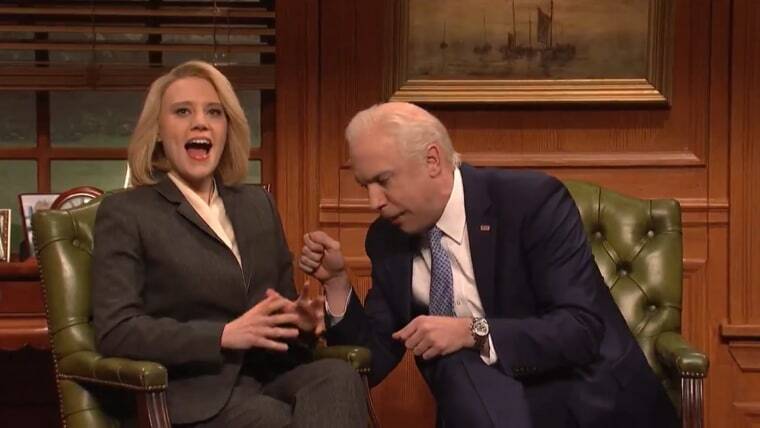 The show opened with a skit in which Biden's political advisers brought in a sensitivity trainer, played by Kate McKinnon, to modify his behavior toward women. Former "SNL" cast member Jason Sudeikis returned to portray Biden. "If you’re really going to run in 2020 you have to change the way you interact with women," an adviser said. Biden responded by referring to a politician's allegation in March that he kissed her on the head and took a whiff of her hair: "I'm a hugger, I'm a kisser and I’m a little bit of a sniffer," Biden said. McKinnon was introduced as Gwen, a problem solver, and Biden greeted her by continually pressing his forehead against hers. "This is exactly the kind of thing that I’m here to prevent," she said. Biden, inspired by U.S. Sen. Elizabeth Warren, D-Massachusetts, said he's taken a DNA test to discover his roots. The former vice president eventually revealed some big news: "Biden and some woman in 2020." The news segment "Weekend Update" doubled down on Biden's woes, with co-host Michael Che saying the former veep "looks like one of those uncles that calls spring 'sundress time.'" Colleague Colin Jost critiqued a Twitter video posted Wednesday, in which an animated Biden said he liked to grab people by the shoulders and inspire them with "gestures of support and encouragement." "It was supposed to be an apology, not a reenactment," Jost said. "He might as well end the video by unbuttoning his shirt and saying, 'To find out what happens next, log on to godaddy.com." The show was hosted by "Game of Thrones" star Kit Harington. Grammy-nominated performer Sara Bareilles was the musical guest.